Google opened their first ever “store” this weekend. To everyone’s surprise, it is based not in New York or California, but in London, UK. 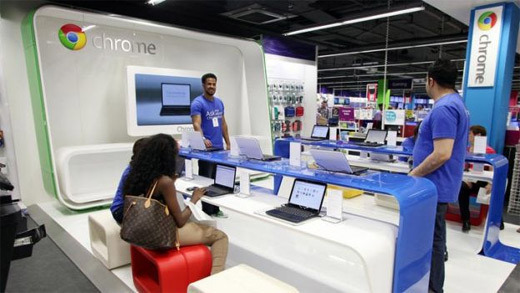 The store is known as ‘Chromezone’ and is actually a mini-store within a popular electronics retail store. It is a 285 square foot outlet, based inside the PC World store on Tottenham Court Road in Central London. Quite surprisingly, the opening of the store was a rather quiet affair. In complete contrast to the hugely publicised opening of the first Apple store. The store will sell Google’s Chromebook laptops and a few accessories, such as headphones. It will be operational for a short duration of time only; until just after Christmas. Google plans to open more stores shortly. The next one is scheduled to open on the 7th of October in Essex. Other stores will also be opened worldwide in the run up to Christmas. While Google may never go down the route of Apple and open dedicated stores to sell hardware, this is definitely an interesting new direction for the company. Perhaps they’ve learnt a lesson or two from their previous failed attempts to sell the Nexus One online and have decided that old-fashioned retail might yet be the best way to sell new hardware.